How does one get started with calligraphy? What supplies can you recommend for a beginner? I get those kind of questions about every other day. So I decided to start this series of Calligraphy 101 to give an introduction into this world I have really started to love in the past year. In this first post I want to give you guys an introduction into what I would consider the best supplies to get started if you never used a dip pen before. I know, if you are here you’ll already have a basic idea of what this is but I still feel like I need to go and distinguish it especially from lettering. Because it is not the same. Lettering is really more drawing than writing. You are basically painting your letters. Calligraphy really is the art of writing beautifully. There are different kinds of calligraphy, I will focus this on pointed pen calligraphy, not flat edge calligraphy. So we are talking about flexible nibs and not about something that would be used to produce a black letter/gothic/fraktur kind of style. There is this whole world of traditional calligraphy with a century long history. Styles of the traditional calligraphy would be Spencerian or Copperplate, which is also a bit of an ambiguous term because it may refer to what is also known as Engrosser’s (or Engraver’s) Script or English Roundhand. I am currently learning Copperplate aka English Roundhad, but I’m not in a place where I’d consider myself “fluent” in that hand. What is also very popular at the moment is Modern Calligraphy, which is what I have started with and what I’ve been doing for a year now. Modern does not really follow specific rules and is a lot more about a personal, more messy style than what traditional calligraphy is. The first question many people ask me is what they should learn first. I feel very honored to be asked this question, because I am still very much at the beginning of my calligraphy journey, but here’s what I usually answer those people. What Style should I learn first? The style that draws you in most. It’s really that simple, actually. 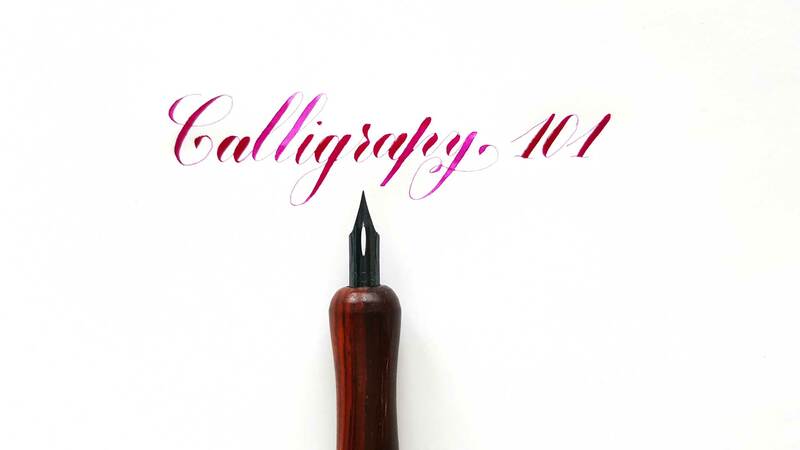 There are tips out there that you should start with the easiest hand and work up from that, but I really feel like you should not learn something you are not interested in because learning calligraphy is time-consuming. It is something you will not master in a matter of weeks or months, it takes years to really master this craft to an extent that it will be perfect every single time. Especially when we are talking traditional. I started with modern calligrahy, because that was what I saw first on Instagram and it felt easiert because I had been doing brush lettering in a modern style and kind of developed a style I liked. I basically just translated that to pointed pens. I have never been a fan of drills and am only slowly easing into this world, so for me it was a lot easier to get started with that and work my way into the traditional style later on. But ever since I started learning traditional rules, I feel like my modern calligraphy has gotten better, because I am looking to make it more structured. It really depends on what kind of person you are. If you feel lost in the world of modern calligraphy because you are floating in a space of semi-structured approaches to learning and too much freedom the restricted, structured world of traditional calligraphy might be a place where you feel right at home. Other people feel confined by the traditional approach and like to go modern. It really is a matter of personality and it’s the same as with any kind of art. Either you go loose and formless or try and recreate the beautiful exact pieces previous masters have done ages ago. Whatever style you choose, the tools will be the same. There are really 3 (4) things to calligraphy. Paper, Ink a Nib (and a Holder). It’s really the combination of all of these that make calligraphy fun. Especially when starting out, many people do only consider parts of this, which will then end up completely ruining it. I know I did not consider ink and paper at all at first. that’s why my first approaches went pretty horribly. That’s what one of my first ever tries looked like. So let’s talk about some “foolproof” tools I would use to start with. Finding paper that does not bleed with the tons of ink some nibs deliver is hard. So there is basically one foolproof paper manufacturer that works with even some horrible fountain pen inks. Clairfontaine. It is a french brand behind some of the most popular papers you max know. Clairfontaine the brand is great, you might hear Rhodia pop up pretty often too. Rhodia – the brand behind is Clairfontaine. These papers are really some of the best. They are however sometimes hard to find outside of Europe. I am lucky to live in Switzerland where we have quite a fountain pen culture so lots of the paper that we get in pads is pretty good already, and we are able to find this in stores, but usually online is your best choice. But this paper tends to be quite expensive and especially in the beginning, you are going through lots of paper. So copy paper and printing grid lines on it (there are some grids in the freebies section to download) are sometimes your best choice for the money. If you go and get premium laser jet copy paper (so basically get the most expensive copy paper and you’ll still get away cheaper than with the Clairfontaine) you’ll get some decent paper. It will usually not take as many inks as the french paper will, but if you go with my ink recommendation you’ll be able to get a pretty good practice situation. The Paper by HP is very good, I recently got some by Canon because they didn’t have HP in the store and I had run out, it is not as good as HP but still recommendable. Fountain pen ink is not calligraphy ink. It is something I really had to learn because I have quite a big fp ink collection and I couldn’t really use them. You can however, turn these into calligraphy ink by mixing some up with Gum Arabic. Gum Arabic thickens it up. I will try and do a separate post on that, but you can do some research if you want to try before that. But there are inks especially made for caligraphy. I personally love Walnut Ink and Sumi Ink. These are fantastic. And if you have some extra money and love sparkles – Finetec is amazing too. Sumi is Asian Ink and has a beautiful smooth texture. It is thick enough to be used on even some pretty low quality paper. It usually comes in black, but is also available in Vermilion, which is a very fun color. I use the Kuretake Sumi ink (the non-waterproof version) it is amazing. Walnut Ink is made from Walnuts and has been used for a very long time, Da Vinci has drawn with it. It has this beautiful brown color that’s subtle but shading and it’s gorgeous to look at. It will not work on as many papers as the sumi ink because it’s a bit thinner but still produces beautiful hairlines. I usually get Walnut Ink Crystals and mix it up myself, but you can already get it in liquid form. The Crystals tend to be cheaper though and you can mix it up a bit thicker or thinner how you like it. Just a quick word on Iron Gall ink. This is very old ink. It is waterproof and a lot of fun to use, when you first get it. The hairlines are stunning. But: this is quite aggressive ink. It will eat up your nibs literally. I have quite a lot of nibs that have suffered a bit. I don’t use them nearly enough to replace them just yet, but I have replaced the ones I love by now. Still. Either get a designated “to be killed really fast nib” to be used exclusively with the Iron Gall (and don’t use vintage nibs with them, these are too expensive for the rate in which you have to replace them) or don’t use it. I actually have my bottle just sitting in a corner and don’t use it anymore because I think it is a waste of a nibs life. Finetec is amazing. It is a brand from coliro and is a bunch of gorgeous metallic colors. You have to brush these onto the nib as it comes in pans, but so worth it! UPDATE: I posted the nib collection blogpost here. Gillott 303 · this is my most used nib but it is quite hard to use when you start, because you will most probably be too heavy handed when you start using it. Leonardt Steno · I got this nib fairly early on and it did cause quite a lot of blobbing and frustration for me. I had a lot of trouble when I used it because I was pressing way to hard on it. Some poeple like it a lot, I had lots of trouble with it at first (do like it now, however). Nibs come with a special coating on it, that protects the nibs from rusting. You should remove this coating because it’ll make the ink blob on the nib and prevent it from flowing nicely. This is especially problematic when you are starting out because you want your nib to work reliably. The nib will also blob if you touch it with your fingers as the grease will transfer. My preferred method is to use rubbing alcohol. I have a bottle sitting on my desk and will just dip and wipe the nibs to prep and clean them when I find the ink not coating the nib evenly. There are different kinds of holders. Namely oblique and straight ones. Which one to get depends on the style you want to write. If you want to write upright, get a straight holder. If you want to write slanted, you might want to look into oblique holders. I personally don’t really use my oblique holders anymore, since Paul Antonio taught me how to hold my straight pen for Copperplate on an angle and I have adopted that kind of paper position and pen grip so when I grab an oblique holder it just ends up being weird for me now. There are some great blog posts explaining different types of holders. I plan on doing a blog post on these as well at some point, but really almost any holder will do. The nibs mentioned above should all fit in the standard holders out there. For the straight holder just stick it in there, the oblique has a bit more of a requirement to use. I posted a video a while ago, so you might want to check that (this is why maybe you should not get the speedball plastic oblique, as some nibs will not fit in there correctly). If you are in Europe like me you might have some trouble finding nibs and pointed pens, especially here in the German-Speaking part of the world, we are not really into pointed pen and flat edge calligraphy is much more common. Still there are websites and they luckily do ship internationally. I usually go and order quite big batches of stuff and it makes the shipping worth it. there is however a Scribe in Switzerland with an online shop where I get most of my vintage nibs and last minute replacements in case I can’t wait for a package from the US to arrive. However modern nibs tend to be more on the expensive side there and I get these in bigger batches from the US. How often do I practice, how do I get started? Getting started really depends on the style you want to use. Usually there are some drills for each style, just start by familiarizing yourself with the script you want to learn. A lot of calligraphy is done away from the pen where you just look at the shapes and strokes you are trying to reproduce and research on the subject. The thing with practice is that the more you do it the faster you’ll see results. But obviously you will not learn this overnight. Calligraphy is really all about muscle memory. So the more often you work on it, the easier it gets. I try to practice every day for at least 15minutes to an hour. I hope this gave you a general introduction into the subject and hope that you’ll go ahead and dive into this wonderful world of pens and nibs and paper and beautiful words.